My first attempts at finishing this demo didn’t go too well. 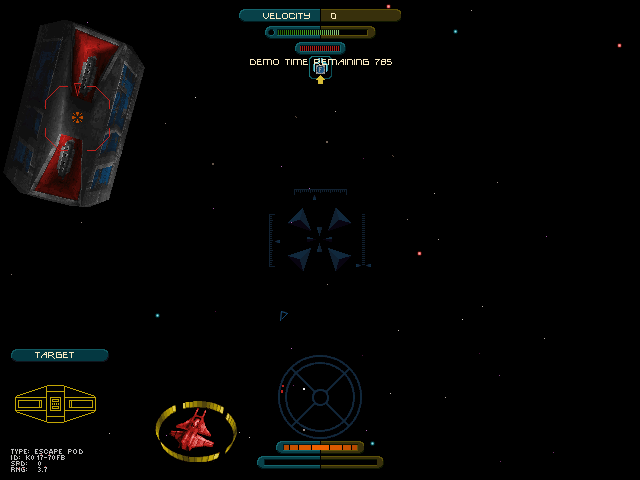 On launching it always presents the player with a mission to rescue an ejected pilot. It’s the same mission each time but the location at which he has ejected is seemingly random. 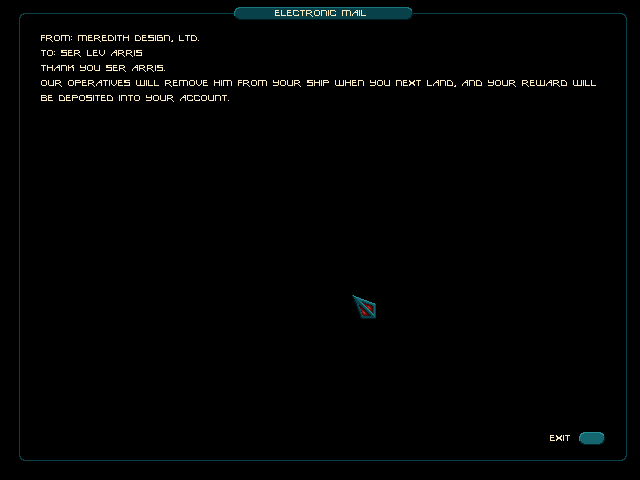 However, it never seemed to be so random that he was near enough to reach before the timer on the demo expired and my ship blew up. However, one of the things I tried to run on my DOS PC was this demo and the first time I tried it the escape pod was only a single jump away from me. This should have made it easy, except I couldn’t remember the key to tractor him in (yes it’s T), and while I was randomly trying keys one of the enemy ships shot him down. It didn’t help that the demo was running way, way too quickly on the PII. This at least confirmed it was possible to complete, and forearmed with the knowledge of which key to press I set out to have another go today. I never had such a short journey but I did manage to reach him 11 jumps from the start after several attempts. Not having much time left, I ignored the 3 fighters and tractored him straight in. It’s not much of a reward for completing the mission but if a jobs worth doing… The idea of landing to collect the reward was completely out of the question as I had about 20 seconds left. This entry was posted in Privateer 2 - The Darkening by Pix. Bookmark the permalink.